The manuel that came with my B7100 says to use 10 W 30. I want to use Rotella T and all I can find is 15 W 40. Will this hurt my tractor? Use it and enjoy better cold weather starting, better hot weather performance and longer engine life. Stay away from artificial milk, fake meat, replicated butter and plastic eggs, but embrace and use good quality synthetic oils in all your vehicles. Mark, I think their 15w-40 oil is straight multigrade. Rotella T does have a 5w-40 in synthetic (site below). Thanks for the correction..... it does appear brandyf is referring to the non-synthetic oil. But to re-address the question, I would be comfortable in this situation using a fine diesel oil like Rotella in 15W-40 where a 10W-30 is called out, unless we are talking about a very cold climate. I agree with Marks comments. Any good quality 15W-40 diesel engine oil should work just fine. Rotella T is indeed a very popular, proven, and fine oil. I personally use John Deere 15W-40 Plus 50 synthetic blend in my 4410, Cummins, boat, and Nissan. Works very well and has very good cold weather start characteristics. DON'T skimp on the oil filters; they are nearly as important as the oil. I suggest using the OEM or a Fleetguard cross over oil filter if available. If it is a cold climate you might notice how long it takes the oil light to go off when starting during a cold snap. Some filters have anti-drain back valves and some don't. On my Ford heavier oils in the cold seem to take considerably long for the pressure to come up to normal. The initial pump flow of 15W oil in 0F starts would be very low. A lot of engine wear happens during warm up and I figure the faster the pressure comes up the better. 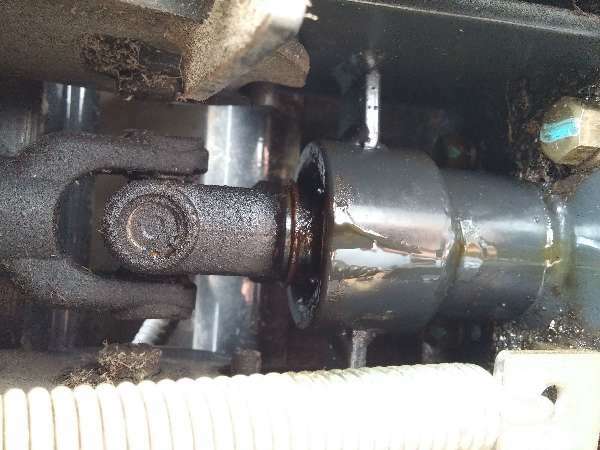 Some people with compression releases say they release the compression and run the starter with the throttle shut off until the oil pressure comes up. I've even heard of external oil circulators. I guess I'm making an argument for lighter oils for really cold climates. Of course, heavy work on very hot days should be avoided when using 30W oil but oils like 5W-40 are available. True synthetics have very good cold as well as hot properties. For cold weather you need to look at the initial numbers which refer to the viscosity at the low temperatures. For more info you can search the TP achives on oil. In general the lower the first number and the higher the second number the better. The synthetic Rotella T is available at Walmart and it normally has a good price. Although good comments have been made from both sides of the coin as to the validity of using 15w-40 oil in your B7100, I have been using Shell Rotella 15w-40 up here in New England with out any difficulties, Summer or Winter down to about -20F when I fire the girls up! I had a B7100 for many years, ran fine on 10w30, and just as fine on Rot.15w40. MY Kubota B-2150 votes for Shell Rotella 5W40 100% synthetic puchased at Wal-Mart for 12.99.